An artist has designed a stained-glass window in the triangular shape and has one strip siding at the left that can complete the window. Now you need to calculate the length of the last side based on the length of other sides. Can you do it your own? First of all, you should know the line segment how it is related to the missing side logically. Well, this is not easy theoretically but you could apply a popular theorem in mathematics to make this thing easier for you. The theorem will give a perfect idea of how the sides are related to the line segment or the missing side of a triangular window. Before we go deep, let us first understand the definition of the Theorem and how it helps in understanding the theorem. The cevian of a triangle is the line segment that runs from different vertices of the triangle to the side opposite to that vertex. For the Triangular Window, the cevians of the Triangle would be the line segments because they always run opposite side of the vertex. Let us explore the theorem to get a better idea of the concept and how it can be used in the real-life too. We have studied the definition of the Cevas Theorem already. Now if we calculate the reciprocal for the given equation then it is always 1. Please keep in mind that cevians don’t lie always within a triangle as shown in the diagram above. Here, we have taken the simplest example to enhance your learning experience and knowledge in mathematics. The proof using Routh’s Theorem is extremely trivial, so we will not include it. So, you just need to know what Cevas Theorem is, its formula and application, not the derivation of the theorem. 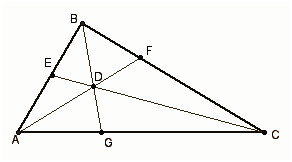 In other words, Ceva’s Theorem is related to the sides and vertices of a triangle. In particular, the theorem states that for a triangle ABC and the points L,M,N that lies on AB, BC, and CA sides respectively, there holds a necessary condition as shown in the expression below. The theorem was proposed by Ceva in 1678 but proven much earlier in 11th Century by a popular mathematician. Today, this is a part of your study and should be learned in depth if you wanted to apply the same in the real-life. Further, this is possible to generalize the theorem through simplexes using barycentric coordinates. Define the cevian for each of the simplexes as a ray from the vertex point in the opposite facet. The theorem has also been generalized to triangles on other surfaces of constant curvature.